Arthritis is very common in senior pets and it can be aggravated by the weather, injuries, etc. 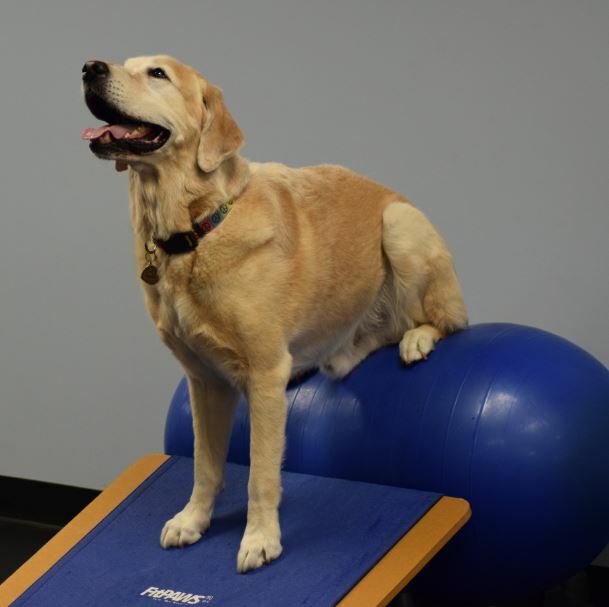 Some dogs also develop neurologic issues as they age that can cause mobility issues. “Well, he/she is just old” isn’t the end of it. So much can be done to improve their quality of life. Although your fur baby may not be able to chase squirrels, climb a flight of stairs, or jump in the car anymore, they can still have a good quality of life as they age. Pain control is very important. No one wants to get up and move when they are in pain. If your pet has difficulty rising, limps, seems restless or agitated, he/she may be uncomfortable. Talk to your veterinarian about medications and/or modalities that could give them some relief. Products such as Omega Benefits and Dasuquin Advanced are also great supplements for middle age dogs and dogs that have had surgeries such as Cruciate repair or Hip Replacement. These supplements help to support healthy joints. Massage, cold laser therapy and acupuncture are also quite helpful in easing and controlling discomfort. Paw traction is often overlooked and older pets tend to be less stable and confident on slippery surfaces. By keeping their nails short and the fur on their paw pads trimmed, they will be less likely to slip. Yoga mats or carpet runners on hardwood or tile floors can also help. Toe Grips are small non-slip grips that fit on your dog’s toenails to improve traction. 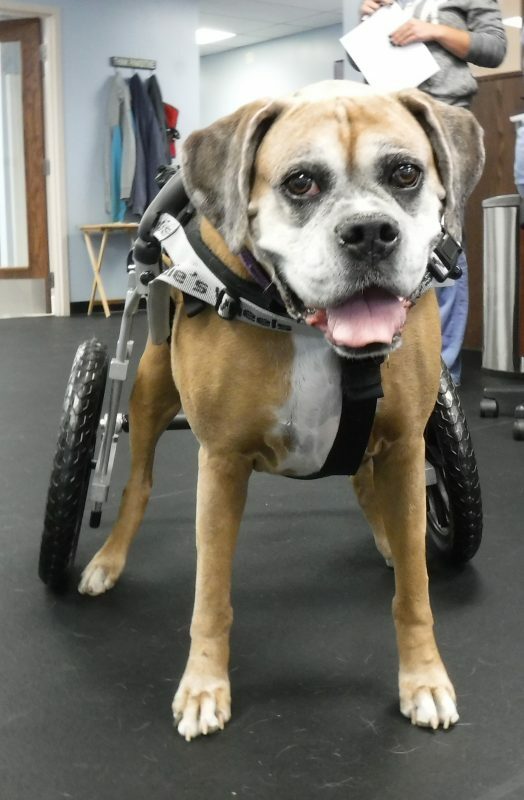 Assistive devices are great tools to help pets with mobility issues. Help ‘em Up Harness is one of our favorites. This harness can be worn all day and has a handle over the shoulders as well as one over the hips. This allows you to give them some support when they need it and is a life safer for owners of larger dogs! Ramps and pet stairs can help your pet get in and out of the car or on and off of the couch. Pet strollers are great for smaller dogs that still enjoy going on outings, but can’t walk long distances. Carts allow dogs with limb paralysis or severe limb deficiencies to go for walks or have supervised play. Mental stimulation is good for everyone! And yes – old dogs CAN learn new tricks! There are many interactive dog toys available. Find one (or a few) that your dog enjoys. Play hide and seek games. Take your pup for walk or a ride in the car if they enjoy it. Although old age is not a disease, it can come with some challenges. If you’d like more information about any of the information provided in this blog, please contact us at Pawsitive Steps Rehabilitation & Therapy for Pets (248) 564-0309.